On February 18th, the Waterfall Building was the setting for yet another great event by Vernard LuvNGrace and Modern Working Woman - An Evening of Elegance with Madame Moje. 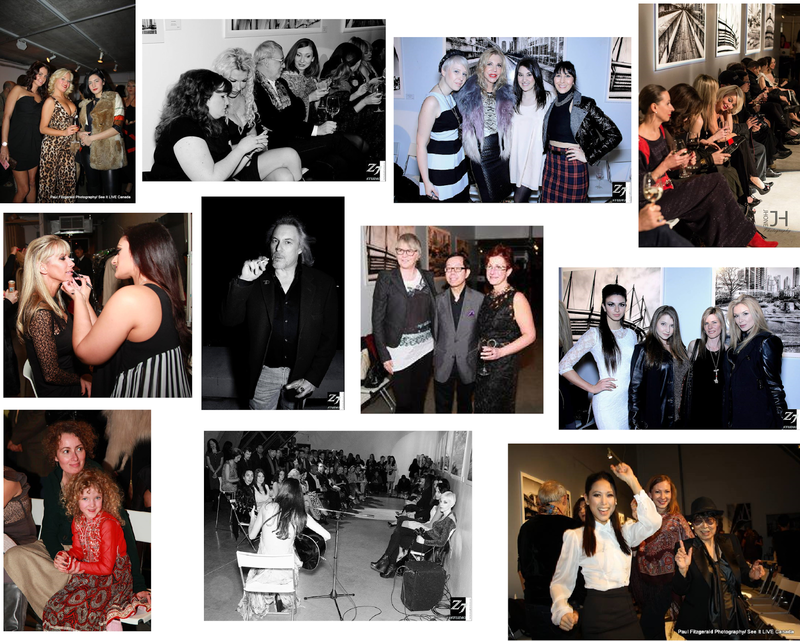 Guests came decked out in their finest to enjoy this evening of fashion, jewellery, music, art, appetizers and wine. Funds were also raised for Beauty Night Society which helps disenfranchised women and Join The Pipe offered information on their international organization and its goals. When you enter a venue for an event, the first thing you notice is the space and the Waterfall Building is truly beautiful. Next comes the music. This evening it was spun by DJ Angel of Boy Meets Girl. Then you start to wander. There were 3 booths to peruse - Jewellery designers Street Cat (Pam Jackson) and Earth Essence (Tamara Ryan) along with Goods vs Evils Skin Care. Another great exhibit was the live painting demonstration by artist Asiza Demetrian Ilicic. Mid-evening we all took our seats for the show. The event was hosted by Amanda Webster, CEO of Be Inspired. We also heard Caroline MacGillivray speak about Beauty Night Society and were treated to several soulful songs by singer Tiara Sorensen. I love live performance and when it is only accompanied by an acoustic guitar. I am in heaven. Last on the evening's schedule was the piece de resistance - a fashion show by Madame Moje. This luxury designer is fairly new on the Vancouver scene, but is already known for fiercely feminine, modern classic silhouette-driven designs centering on signature body-hugging dresses, easy chic playsuits, knit separates, sleek jackets, sophisticated trenches and outerwear. For her it is all about what she would love to see in her closet. Most fabrics included at least a bit of stretch for comfort. My personal favourite was the off-the shoulder dress in a deep red above left. I'll let the images speak for themselves as seeing is so much better than describing! Want to see more - check out her boutique at 2843 Granville Street. And if you're heading to Toronto for World Mastercard Fashion Week - she'll have her designs on the runway on Friday, March 21st, at 5 p.m. The evening ended the way I wish all evenings would end - with a warm bite. I truly loved the hot, slightly spicy appetizers provided by the Silk Dinner Lounge as well as my delightful brief chat with owner Balraj Sivia. Can't wait to try some of his other offerings including ones he personally describes at "HOT" - an adventure I'm looking forward to! Special thanks to Sponsors - Stelling The City Realty (Deborah Stellingwerf), Niche Magazine, VanCityVogue, Goods VS Evils, Silk Dinner Lounge, Street Cat Designs, Earth Essence Jewelry. Also thanks to the many individuals who volunteered their time for this event. Front Door - Stephanie Rosario. Bar - Rachel Ryall. Models - Reiko McKenzie (RHOV), Robin Reichmann (RHOV), Alexandria Kay, Steph Dietz, Corinna, JEssica Rose Dombro and Ekaterina Krivosheina. Hair and make-up by students from Blanche Macdonald. Candid images in collage below courtesy of Zed Studio7, Claude Duke, Jason Hone and Paul Fitzgerald. For more on upcoming LuvNGrace events go to http://www.luvngraceaffair.com/.